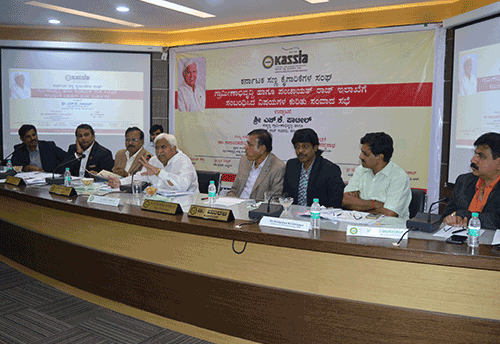 Bengaluru : The Karnataka Small Scale Industries Association (KASSIA) interacted with the Minister of Rural Development and Panchayat Raj, Karnataka, HK Patil to discuss issues of concern to MSMEs in the rural areas and towns that come under the various Panchayat Jurisdiction. A.Padmanabha, President, KASSIA raised a number of issues that were of concern to SMEs operating in Panchayat areas such as the property tax, general license, interference and other which needed to be resolved for the smooth operation of SMEs. Emphasizing particularly the issue of property tax, he said that now the tax levied by Panchayats is often two and a half times more than what is normally levied in BBMP jurisdiction on industry. “This was quite unjustified. MSMEs are no longer protected and had to compete in the global market to survive. Therefore, good infrastructure and ease of doing business were crucial,” KASSIA President said urging the Panchayati Raj Minister to address these issues so that there can be the desired industrial dispersal and job creation in the rural areas. In his address, Patil assured KASSIA that the problems highlighted by them would be addressed suitably and resolved in order to create a good environment for the functioning of industry in the Panchayat areas. Responding to a number of queries from the industrialists present, he assured that the issue of property tax and irritants like the general license and the unnecessary interference by the Panchayats would be looked into and resolved. He assured KASSIA that he would set up a small committee, headed by the Panchayat Raj Director, with representatives from KIADB as well as industry associations such as KASSIA, Peenya Industries Association and other bodies to go into the details of the property tax in Panchayat areas and would examine the feasibility of making a distinction between SMEs and others. He said that the Government would certainly consider levying differential rates based on size such as micro, small, medium and large so that MSMEs are not unduly taxed heavily being clubbed with industry in general. The Government would also take steps to improve road infrastructure in these areas so that industry can operate normally. He would soon discuss these issues with the Ministers of Industry as well as others concerned to arrive at suitable solutions. He emphasized the need for creating a congenial environment for industry to operate in rural areas and assured that he would strive for the same. The Minister persuaded the MSMEs to make investments in rural areas especially in Gadag which provided a good environment for industrial investments. He said that investments in wind and solar energy and in other areas could be profitably made in the Gadag region which afforded excellent environment and human resources for such investments.